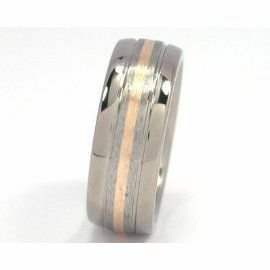 A center groove is filled with a Yellow Gold inlay on this spectacular titanium men's wedding ring. The titanium band is crafted out of aerospace grade titanium and is 7mm wide. The comfort fit band is expertly made and showcases a hand completed, Premium, Stone Finish! This amazing mens wedding band is strong, light-weight, stunning in design, skillfully made, comfortable to wear and scratch resistant! What is 94 + 8 = ? &COPY; 2017 The Jewelry Source. All Rights Reserved.